Technology satellite for NASA Goddard Space Flight Center, USA. Launched 2006. AKA: NCT. First Launch: 2006-03-22. Last Launch: 2006-03-22. Number: 1 . Gross mass: 25 kg (55 lb). More at: ST 5 (NCT). American technology satellite. 3 launched, 2006.03.22 (ST5-A) to (ST5-C). Status: Operational 2006. First Launch: 2006-03-22. Last Launch: 2006-03-22. Number: 3 . Gross mass: 22 kg (48 lb). 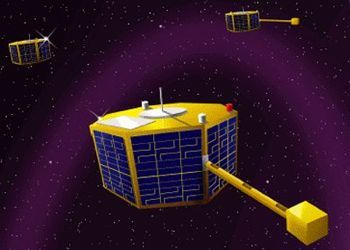 Space Technology 5, one of NASA's New Millennium Program projects, consisted of three small spacecraft, each a half meter in each dimension, with a small extensible magnetometer boom. Study of the magnetosphere was however secondary to the Nanosat Constellation Trailblazer technology mission. This was to demonstrate fully functional nanosatellites, which included a cold gas microthruster and miniaturized telemetry/command and power systems. Family: Technology, Technology satellite. Country: USA. Launch Vehicles: Pegasus, Pegasus XL. Launch Sites: Point Arguello WADZ. Agency: NASA Greenbelt. Bibliography: 2. 2006 March 22 - . 14:03 GMT - . Launch Site: Point Arguello. Launch Complex: Point Arguello WADZ. Launch Pad: Aircraft from Vandenberg.. Launch Platform: L-1011. LV Family: Pegasus. Launch Vehicle: Pegasus XL. ST5-A - . Mass: 22 kg (48 lb). Nation: USA. Agency: NASA Greenbelt. Class: Technology. Type: Navigation technology satellite. Spacecraft: ST5. USAF Sat Cat: 28980 . COSPAR: 2006-008A. Apogee: 4,539 km (2,820 mi). Perigee: 302 km (187 mi). Inclination: 105.60 deg. Period: 136.90 min. Space Technology 5 was one of NASA's New Millenium Program projects. It consisted of three small spacecraft, each a half meter in each dimension, with a small extensible magnetometer boom. Study of the magnetosphere was however secondary to the Nanosat Constellation Trailblazer technology mission. This was to demonstrate fully functional nanosatellites, which included a cold gas microthruster and miniaturized telemetry/command and power systems. The Pegasus rocket was dropped from the L-1011 carrier aircraft over the Pacific at 123 deg W x 36 deg N. Air dropped in Point Arguello WADZ. ST5-B - . Mass: 22 kg (48 lb). Nation: USA. Agency: NASA Greenbelt. Class: Technology. Type: Navigation technology satellite. Spacecraft: ST5. USAF Sat Cat: 28981 . COSPAR: 2006-008B. Apogee: 4,540 km (2,820 mi). Perigee: 301 km (187 mi). Inclination: 105.60 deg. Period: 136.90 min. Air dropped in Point Arguello WADZ..
ST5-C - . Mass: 22 kg (48 lb). Nation: USA. Agency: NASA Greenbelt. Class: Technology. Type: Navigation technology satellite. Spacecraft: ST5. USAF Sat Cat: 28982 . COSPAR: 2006-008C. Apogee: 4,539 km (2,820 mi). Perigee: 303 km (188 mi). Inclination: 105.60 deg. Period: 136.90 min. Air dropped in Point Arguello WADZ..